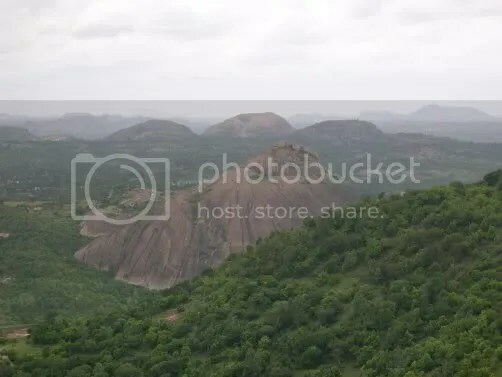 Ever since Sreekanth initiated me to rock climbing in the rocky hills of Ramanagaram, I have visited Ramanagaram so many times that I have lost count of my visits to this place. Ramanagaram town is situated at 50km from Bangalore on Bangalore-Mysore highway. Ramanagaram is well connected both by rail and road from Bangalore. There were times when we would be found on the rocks of Ramanagaram on any weekend. Though the frequency of visits has reduced over the years, we have still not lost touch with all those rocky hills. I should confess before I say anything more that I am not a professional rock climber. We have been content doing the normal climb over the rocky hills without any safety equipment or climbing gear. Though we never do vertical climbs, we have had our share of thrills on the rocks over the years. We have even come across one-next-step-to-disaster kind of situations a few times. Our approach to rock climbing is simple; it is important to reach the peak and it doesn’t matter how we reach there. So whenever a challenging climb hasn’t been possible, we have been content taking the less risky and more easier routes to the peak. 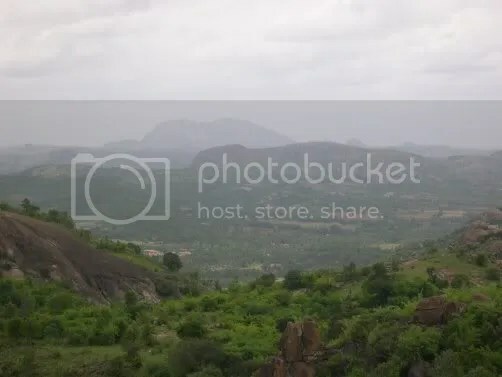 Ramanagaram has a unique landscape. It has innumerable granite monoliths spread over a wide flatland. 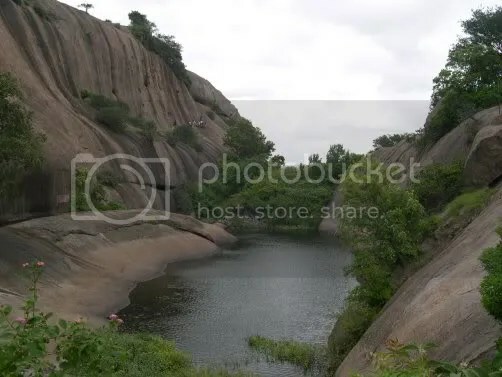 The area itself is fertile with Arkavathi River flowing through it. In fact water can’t be seen in Arkavathi all the year round as it has been dam(ned) in the upstream at Manchibele. Coconut and mango farms are most visible here. Silkworm culture is also present. I clearly remember my first tryst with the rocks. I was with Sreekanth and Shastri. It was a hill adjacent to the well known Ramadevarabetta. We had climbed half the hill by negotiating the 50 degree gradient. One look downwards and I was convinced that there is no way I could return from the same path. Then came a moment when I got too scared to move ahead. Sreekanth and Shastri had to leave me midway and continue their climb. I had no option but to wait till they returned; I was too scared to even go down. We had to then descend from an other route. Since then I have taken a few first timers to Ramanagaram and every time I have observed the same fear in them. Fortunately this fear is generally not seen on subsquent visits; it is just a matter of getting used to climbing barren rocks. Pretty early in my Ramanagaram days, I had a forgettable experience. It was again near the Ramadevarabetta. We had reached a point from where we had to crawl between two huge rocks to move forward. The space between the rocks was just enough for our bodies to slide through. We left all our bags and crawled ahead. We had to retreat midway as we heard some human talk from below. By the time we come back, my camera was missing from my bag. This incident didn’t prevent me from many more visits to Ramanagaram but that was the last time we took any valuables to Ramanagaram. An unforgettable Ramanagaram experience is about Sreekanth’s (mis)adventure. Once we decided to stay overnight on the banks of Arkavathi river. After climbing a couple of hills on a Saturday, we settled for the night in an abandoned Mantapa on the banks of Arkavathi. Those were the days when the place was still uninhabited. We had a nice campfire going that night and played Anthakshari well into the midnight. 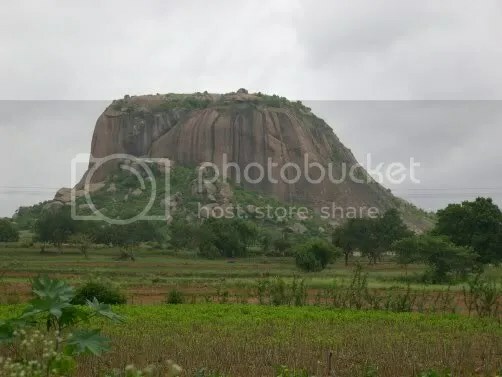 Next day morning we decided to climb a huge monolith which we call the Turtle Rock. The front face of the hill had a minimum gradient of 60 degrees right from bottom till the top. While Ashok and I quickly decided to abondon the idea of attempting from the front face, Sreekanth, the most adventurous of the three moved ahead. A few minutes into the climb, he realized the shoes would be a hindrance and dropped them. The rock face was so steep that Ashok and I had tough time even to get hold of the shoes which were struck a couple of meters on top of us. 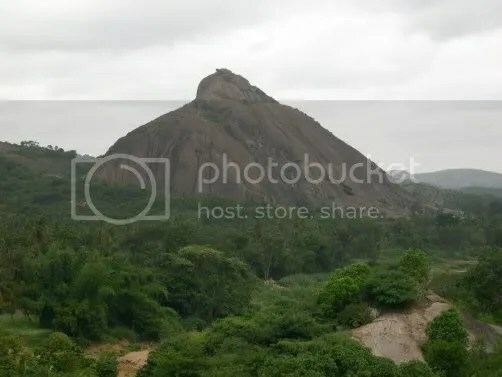 Without thinking much about the fate of Sreekanth (we were so confident about his climbing skills), we crossed over to the back face and started a much relaxed climb from there. 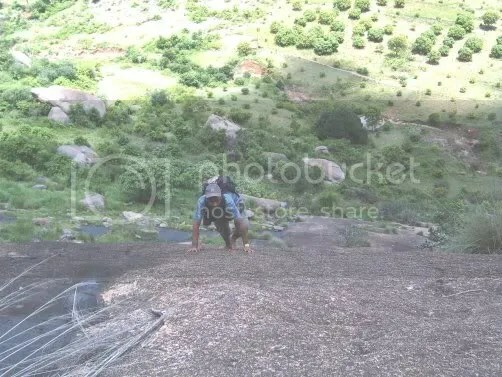 Only after reaching the top and meeting Sreekanth we realized how tough the climb had been to him. He was essentially struck on the steep mountain face, and unable to get back was forced to move up! We have used Ramanagaram as kind of training grounds for our more arduous treks elsewhere. It was first in 2002 when we did a warm-up trek as part of our preparations to our Himalayan trek in Nagtibba. Then again in 2003, I introduced my sister Bharati to trekking by scaling a rocky peak in Ramanagaram. And that was again the warm-up trek to Gangotri-Tapovan trek in Himalayas. In one of recent visits, Sreekanth and I decided to explore a new route. From a vantage point on a small peak, we could see three towering rock pillars at a great distance. We had never ventured that far into Ramanagaram and decided to take a straight line path to that place. The walk turned out to be very interesting with landscapes changing so often. If once we were walking alongside the villagers, next we would be in the middle of green fields. We crossed many Ragi, Mango and Coconut fields on the way. Many times we would end up in no man’s land (I mean forest area). We would either have to negotiate thorny bushes or plain rocks. I remember a group of village ladies we met who advised us against coming to such places as the bears can be found on rocks and they can turn violent quickly. One lady couldn’t help but ask us why exactly we come to such places. We replied her that we don’t have better things to do in Bangalore and hence keep wandering in such odd places. 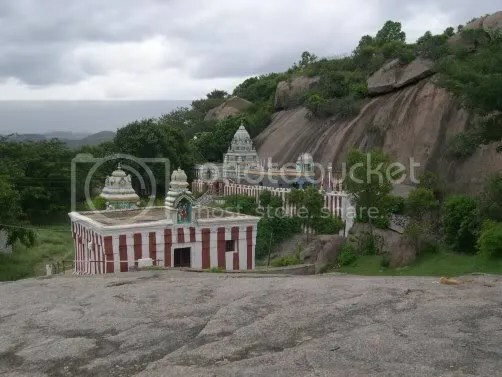 What had appeared like pillars from that distance was in fact a majestic rocky hill and it had a temple at the top. We had become two uninvited guests for the inauguration of the renovated temple. We have had lots of fun trekking amidst green fields of Ramanagaram. Once it was me and Sreekanth enjoying the green tamarind on top of a tamarind tree. The other time it was Sreekanth, Pilla and I successfully pestering a villager to climb a coconut tree to fetch us tender coconut under scorching sun. Ramanagaram is changing slowly. During our visit in July this year, we could see that the Arkavathi’s appearance was being changed due to heavy sand digging. A makeshift mosque now stands where we once spent our night on the banks. A good road has come till the foothills of Ramadevarabetta and the place has become a well known weekend getaway for many. Cashing in on the influx of tourists, many kids from the nearby village have turned into part time beggars. A few rocks have been defaced with painted advertisements. Despite all these changes with changing times, one thing for sure will remain constant. And that is our visits to rocks of Ramanagaram. You are currently browsing the Bharata B Rao's Blog blog archives for July, 2006.